Still on the edge of the site, we can already feel something that resembles a murmur. We are listening to the life origin of the things we are about to discover. A breathing reveals the proximity of organic life, at the very moment we enter the room. At that point, we find ourselves before a forest of inflating and deflating “objects”, hushing or unfolding quietly. Some wallow in haughtiness while others, more timid, are disturbed and tumbling. 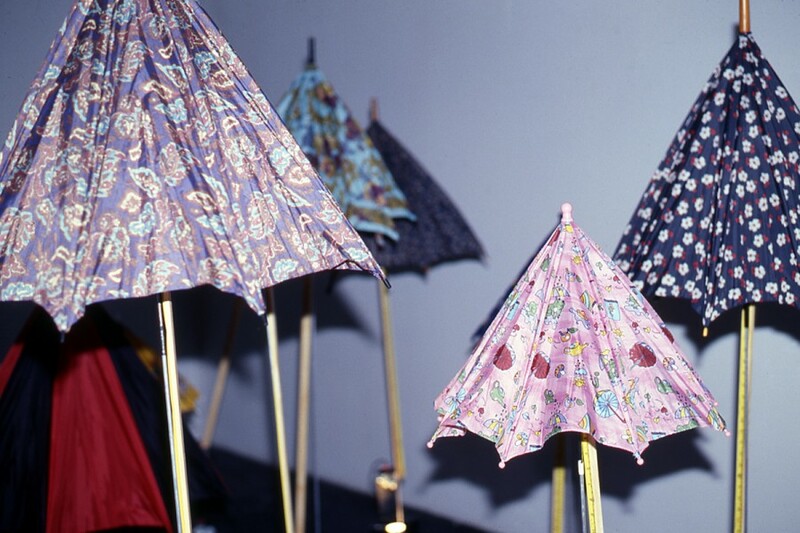 They are umbrellas and sunshades, they are protection instruments. Within this forest, we sometimes surrender to our desire for walking round and blazing a trail throughout the twenty-four rib-made machines inhabiting the space; on other occasions, we remain on the edge, ready to contemplate this metaphor of life and death, this conspiracy of peaceful and articulated rest called École d’aviation. These objects are composite. At their base, a motor system animates many things, bringing their “inanimate” state to life. Its works is randomly decided by a hidden computer distributing the moves according to the peregrinations of its chaotic desire. This motor articulates bellows which sometimes induce, and sometimes not, no longer oral vibrations into the tonal lamella of a harmonica. Via this very system, a crank activates a thin arm that goes up an down. Secured to that stem is a yard where we would want a meter, in order to be able to read milliyard and centiyard increments, but we are only offered inches, imperious with black ink. This moving arm, ascending, works at unfolding the bundle of ribs inflating the element projecting skirt. When the canvas is stretched, a light flashes out, enlightening the freshly created cone. Her Majesty the umbrellas are also cast in colourless metamorphosis. Because shadow stars and light corolla, black suns and geometrical flowers, settle on the ceiling. Shapes move, white or dark. Henceforth, the whole room takes part in the exposition. We must admit that these machines have a life of their own and that they easily be associated to plant or animal pictures. Anchored, constrained things, both stabile and mobile, they sing and move on their stationary base. Light goes along their movement. And if we only walk by, if we only notice slowness of things, we never attend the experience of the transfiguration of their nature. It is true that the sadness of their permanence could distract us from the imminence of the light movement that, even though constrained, will animate them. Because what we witness are poetic sculptures coming to life, no matter how artificial this life may be. They are also social relation machines, opening and closing machines. They didn’t have a schedule, they are tireless. Together, they open up the art piece, which is only truly opened when discovered in the contingencies of its compositions. Simple in the short term, École d’aviation becomes more complex in the long run. It is a fidelity artwork, which teaches us a lesson about the constancy, which, alone, enables us to understand the eternal return exhibition to which the reducing conspiracy of a simulated loop cycle repetition would have been forbidden. It is also an artwork of seduction, both easy and uneasy, in the relational meaning of the word. But is it possible, incidentally, to easily tame a crowd? 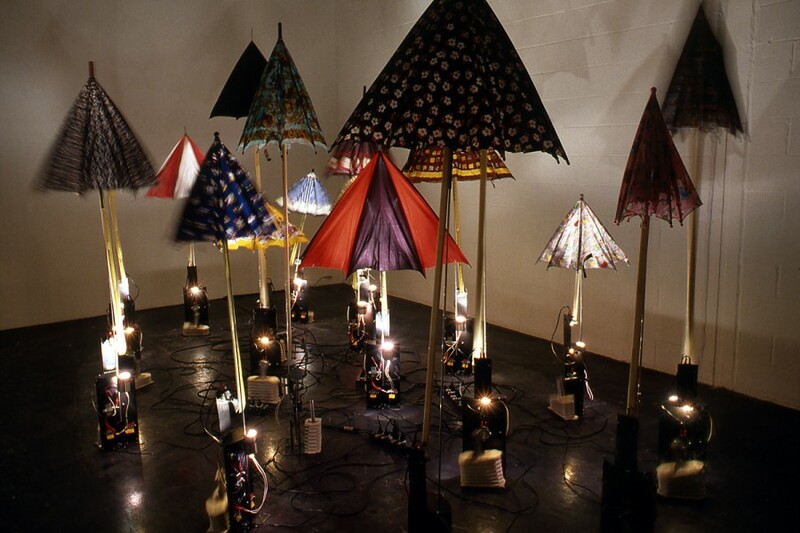 From protection device, the umbrella turned deviant and become projection instruments. They protect and project at the same time. 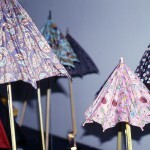 Inverted umbrellas, they are not shades for all that. More opaque than translucent, their mechanical breathing gives them temporary life. They become instruments of light in the night. Life shutters, they create for our eyes corolla shape and skirts. And the beam of ribs joins the radius beam. Instruments of fascination. Metaphor of the loss and strain of existence, École d’aviation is also a breathing instrument, a passages protocol expressing the dignity of any fight for breathing, for inspiration and light. Bedside lamp or constellation strategy. École d’aviation also appears as lung music, a respite symphony in the night of bedrooms. Translated from French by Nancy Carmichael. Diane Landry employs numerous methods in her art practice preferring no one in particular. She devotes her time to create mouvelles, works that integrate the temporal notion of performance and the spatial notion of installation. 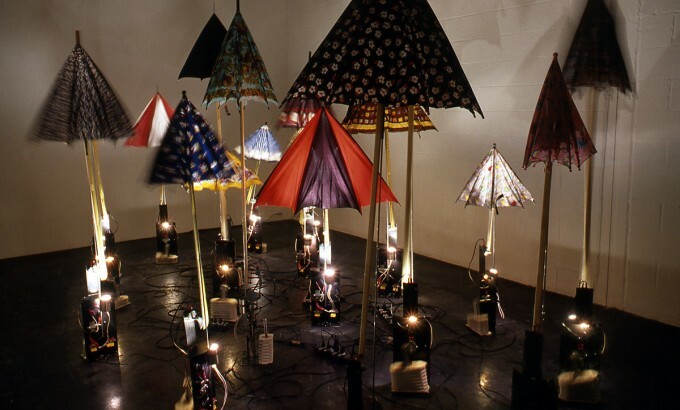 Since 1987 her installations and performances have been presented throughout Canada and in the United States, Mexico, France, Austria and Germany. 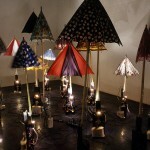 She has participated in many events and has been an artist-in-residence on a number of occasions. A first monograph entitled Diane Landry Oeuvres Mouvelles was published by VU in 1998. She currently lives in Quebec, P.Q.